Great-tasting certified organic jelly beans, now made without corn syrup. All six flavors are quite yummy: Lemon, Grapefruit, Orange, Cherry and Grape. Vegetarian. Click on 'Larger View" above to see packaging. Ingredients: Organic evaporated cane juice, organic tapioca syrup, organic grape juice concentrate, pectin, citric acid, ascorbic acid, colors added (black carrot juice concentrate, turmeric, annatto), natural flavors, confectioner's glaze, carnauba wax, organic sunflower oil. Vegetarian info: These are vegetarian but may not be vegan due to confectioner's glaze. Available in 2.75oz bags or a 10 lbs. bulk case. These are very good tasting jelly beans. Never was a fan of jelly beans until tasting these! Healthier option than conventional beans. These taste sooooo fruity and wonderful! These are so tasty! We avoid food coloring and corn syrup so these are the jelly beans for us! I love them for Easter, or as a sweet treat anytime! 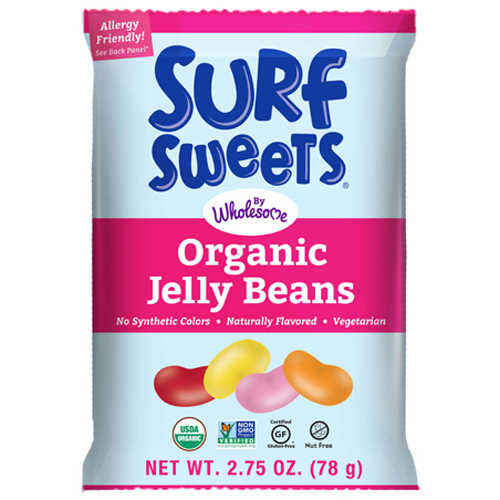 I am a huge fan of jelly beans but after my family decided to eat organic foods primarily, it was hard to find candy I way craving. These Jelly beans are so good, I have to behave myself or I'd have a bag in my hand all the time! These are the best Jelly Beans I have ever tasted. I bought them for my children who have lots of food allergies. They not only loved them but everyone that has sampled them in my family including myself loves them as well...we will be stocking up on more for the rest of the year.